The 1931-32 season became a significant moment in the history of Tranmere Rovers as they announced themselves as a football team with ambition and the squad to match. In 1921-22 Tranmere had joined the Football League as a founding member of the Third Division North and spent much of the 1920s looking like a team not quite sure of themselves. By the end of the 20s and into the early 1930s Tranmere Rover’s name was being mentioned more and more at the top table of English football. The most notable quality that saw Tranmere draw national attention was their ability to find and develop good young players. 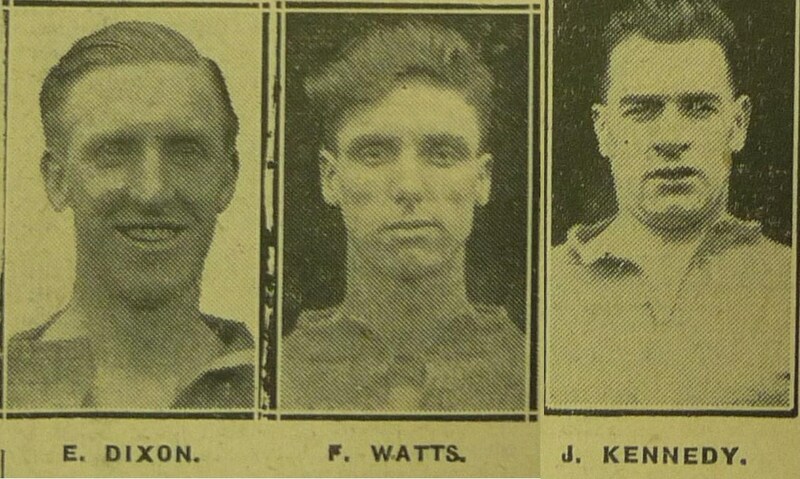 Ellis Rimmer, Thomas ‘Pongo’ Warring and of course Dixie Dean made their first Football League debuts at Prenton Park before moving to First Division clubs and ultimately England. By 1931 Tranmere had yet to display their own brand of football to a national audience only playing against their opponents in the Third Division North. However the luck of the FA Cup draw saw an opportunity for Tranmere to enter the national football scene. After confidentially dispatching West Stanley 3-0 in the First Round of the FA Cup and then Bristol Rovers 2-0 in the Second Round Rovers now had the chance of being drawn against a top club from the First Division. As football fans across Birkenhead flicked to the sport pages of the local press they would have discovered Tranmere had be draw at home against Chelsea. Chelsea who had just been promoted to back to the First Division in 1930 were looking to make a name for themselves taking on some of the great teams of the age including Huddersfield, Arsenal and Everton. Their first move upon returning the First Division was to sign three Scots Hughie Gallacher, Alex Jackson and Alec Cheyne. These names may not mean a great deal to many today but these three were some of the most successful players of the 1920s and 30s. All had been part of the Scotland team who had beaten England 5-1 in 1928, Gallacher had captained Newcastle to First Division champions in 1926-27 and Jackson led Huddersfield to two FA Cup finals and won several league medal with the club. The Chelsea team arrived on the Wirral after their game against Bolton and decided to take in some of the sights. The teams were pictured taking in several holes at the Royal Liverpool Golf Course and were seen by many locals at West Kirby promenade as they stayed at the Royal Hotel. Although it was not all fun as the team were seen training along Hoylake shore, yet not all the players took the sessions seriously such as Hughie Gallacher who smoked cigars whilst rest of the team trained. The Birkenhead News reported that the Chelsea team seemed quite relaxed in their training for Saturday’s game taking in a round of golf every morning. After light training the team would eat the championship winning meal of Beef and Chips with beer to wash it down with. A reporter from the Liverpool Echo managed to catch up with Alex Jackson who proclaimed ‘I can’t see Tranmere having a chance!’ Others writing into the paper poured scorn on Tranmere’s chances against their First Division opposition. However was this over confidence justified? In the modern game clubs at the top flight spend hours pouring over DVDs of their opponents recent games to ensure they are ready for anything. Obvious in 1932 this would have been impossible yet it seems Chelsea hadn’t even checked the results of this Third Division North team. Out of the last nine games Tranmere had played prior to Chelsea they had won seven and drawn two. During that run they managed to play Rochdale twice beating them 9-0 at Prenton Park and away 6-3. Much of this success had been the goal scoring ability of both Ernie Dixon and Fred Watts who the previous season alongside Jack Kennedy had score a total of 96 goals. Unlike the Chelsea team the Tranmere players under the trainer Jimmy Morten spent several hours a day running, sprinting, going through physical and dumb-bell exercises. However it wasn’t all hard work, the team were invited to the Birkenhead Hippodrome the Wednesday before the game to see the Pantomime of Robinson Cruseo. The game though did catch the attention of the national media as the Pathe News Company sent down a film crew to record the game. Prenton Park was looking its best for its first film debut as the new five span roof stand had been built at the start of the season along Park Road West. The stands distinctive roof had been constructed by a company more used to building barns and this design saw the fans nickname the structure the Cowshed . On the day crowds packed into a cold Prenton Park to see their local heroes take on the Goliath’s of the First Division hoping Chelsea’s over confidence would be their undoing. The crowd didn’t have to wait long after kick off for the first bout of excitement as Fred Urmson for Tranmere fired a power shot into the back of the next after ten minutes. However the celebrations were short lived as E. V Gough the referee deemed Meston was in an offside position before Urmson took the shot. 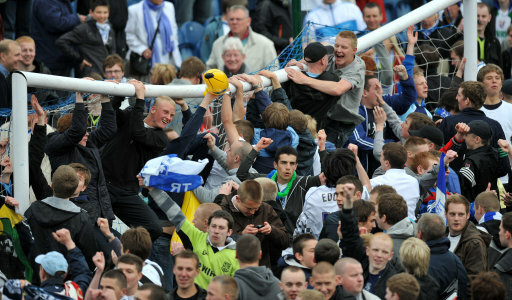 The Tranmere players protested he was not interfering with play but their pleas fell on deaf ears. Chelsea responded to the Tranmere onslaught going 0-1 up after 28 minutes and as the play got underway in the second half Fred Watts equalised bringing Tranmere back into the game. Soon after Ernie Dixon raced down the ground and powered the ball into the back of the net from twenty five yards giving Tranmere the lead. A famous victory was now in the sight for Tranmere however referee Gough hadn’t finished playing his part on the result. Johnson for Chelsea put the ball into the Tranmere box where Pearson headed in the equaliser even though he was in an offside position. The Tranmere players once again found themselves at the mercy of the Gough who again made a controversial decision to let the goal stand. The game finish 2-2 which was a frustrating disappointment for all at Prenton Park even Chelsea who now had to look forward to an unwelcome replay. The gate attendance for the game was around 13,000 which was far below expected numbers however the turnout still produced £1250 from the gate. Ultimately Tranmere’s trip to Stamford Bridge was more clear cut as Chelsea won the day 5-3 ending Rover’s cup run dreams. By the end of the season Tranmere managed a very respectful fourth position finish in the league whereas Chelsea only finished 12th in the First Division. Although Tranmere’s moment in the spotlight was short lived they had managed to raise the profile of the club and their ambition. The game against Chelsea and subsequent games in following season against Leeds, Barnsley and Liverpool showed that this little club from the Wirral were not mire minnows in the game happy just to be in the Football League, but a team with the drive and skills to push on to the highest levels. The last game of the season can be the most important game in a club’s year as success can bring new found triumph and lose can lead to disaster. Days like today can make or break a club. Tranmere are no stranger to the possibility of relegation and have diced with death on many occasion throughout the club’s history. When the Third Division North and South merged for the start of the 1958-59 season relegation was introduced into the new Fourth Division. In Tranmere’s second season in the new Third Division they barely escaped relegation but after two wins against Bury and Mansfield in the final two games of the season Tranmere stayed up. Unfortunately they were not so luck the following seasonas they lost to Notts County 4-1 on the last day and Tranmere were relegated to the Fourth Division. 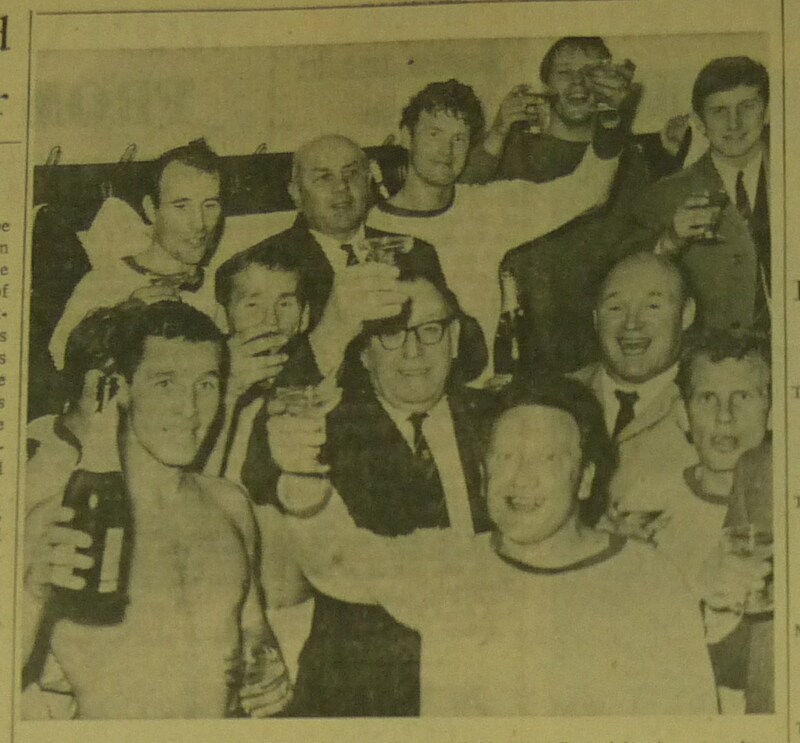 For the next six seasons Tranmere battled for their rightful place in the Third Division and in 1966-67 they regained that place. But the fairy tale of promotion was almost destroyed within a season as Tranmere struggled back in the Third Division and only a last game of the season win against Orient saved Tranmere from the drop. 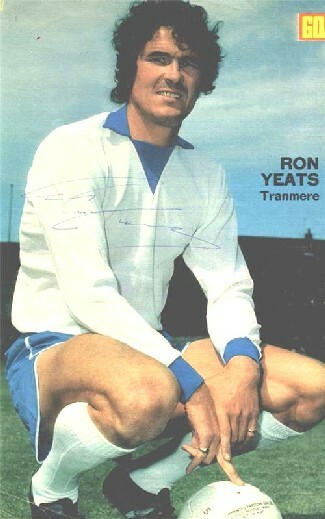 The 1970s and 1980s saw Tranmere yo-yo between the Third and Fourth Division but in the 1986-87 saw Tranmere nearly fall out of the Football League altogether. Financial problems and back room battles saw Tranmere enter a relegation fight which may have decided the fate of the club. Frank Worthington has struggled to string wins together to keep Tranmere up and by February Ronnie Moore was installed as Player-Manager. However his lack of managerial experience meant that the drop was still calling the failing Tranmere Rovers. With only seven games to go Tranmere appointed the club’s greatest legend, Johnny King. King pulled together as many points as he could but the fate of the club’s very survival was going to come down to the last game of the season. Tranmere were face Exeter City at Prenton Park and only a win would secure their survival. This last game of the season was the most important in the club’s history and the people of Wirral knew it as Prenton Park struggled to hold the throngs of supporters on the day of the match. The number of spectators was so great the game was delayed by 15 minute to allow everyone time to get in. The crowds watched with baited breath as a nervous Tranmere team tried to overcome the enormity of the game. By the end of the first half the score stood at 0-0 which at the time would not have been enough to secure Tranmere’s place in the Football League. Johnny King took his side back to the dressing room and said something that inspired his players as they came out to the second half full of confidence. But Exeter still held Tranmere, until the final 15 minutes when Gary Williams found the back of the net for Tranmere. As the final whistle blew Prenton Park could no longer hold back the hoards of supporters as they invaded the pitch to celebrate the survival of their club. Johnny King and Peter Johnson then took Tranmere from the bottom of the Football League to the doors of the Premier League in just six seasons. However after over a decade of success never before seen at Prenton Park Tranmere found themselves back in the Third Division at the start of the 2001-02 season. Over the decade Tranmere moved up and down the table but had never looked like getting relegated until the 2009-10 season. John Barnes had been brought in at the start of the 2009-10 season but failed to grasp the style of lower league football and was sacked. Tranmere’s position was dire and another Rovers legend stepped into the fold to save the club from relegation….Les Parry. The long standing Physio most notably recognised for wearing his famous shorts in all weathers stepped up to the plate to stop Tranmere from being relegated. Tranmere battled on for the rest of season but struggling to find form after the Barnes Premiership. Tranmere’s survival in League One would come down to the final game of the season away to Stockport County. The travelling 3,000 Tranmere fans packed their small corner of the ground cheering on the Super White Army. Luckily for Tranmere Stockport where having an even more torrid season and Rovers won comfortably 3-0 with goals from Ian Goodison, Joss Labadie and Ian Thomas Moore, securing their place in League One. The 1980s for Tranmere Rovers saw the club go from near extinction to Wembley in a matter of years. Tranmere went from administration to a club with the money to match their ambition of being a First Division club. By the mid point of the 80s Tranmere were languishing in the lower part of the Four Division and by 1987 it looked like their sixty five years in the Football League would come to end as relegation seemed almost certain. However by beating Exeter on the last game of the season Tranmere stayed up and from that point began to climb back up the tables. 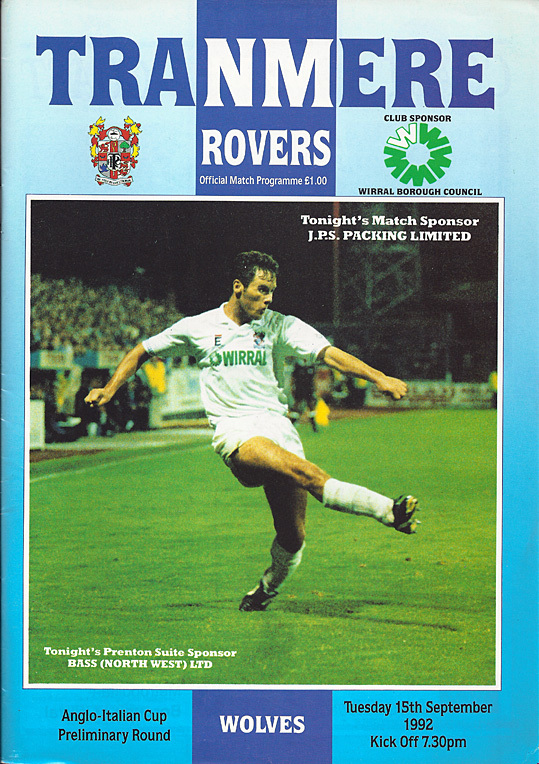 The 1988-89 season saw Tranmere not only return back to the Third Division but through the automatic promotion spot. When looking down the team sheet of the Tranmere team of the 1988-89 some of the club’s biggest names litter the page. With the likes of Dave Higgins, Eddie Bishop, Jim Steel, Ian Muir, Chris Malkin, John Morrissey and Steve Vickers to name a few, the team in 1989-90 looked its strongest since the 1930s. The start of the season for Tranmere couldn’t have been better notching up four wins in a row in all competitions. By November had already pulled together twelve wins including a 6-0 hammering of Bristol City. One game dominated November however which was the visit of Tottenham to Prenton Park in the League Cup. One game that month however at the time had little significance other than to settle old scores with a local rival. On November 7th Chester came to Prenton Park in preliminary round of the Leyland DAF Cup a competition few showed much interested in. However as Chester were a local rival over ten thousand fans packed the old stands at Prenton Park to see Muir score the only goal in the game. This victory may have seemed small in the grand scheme of things but it set in motion the wheels which would see Tranmere reach Wembley. After seeing of Rochdale 1-0 in the final Preliminary game Tranmere’s next opponent was Scunthorpe United at home. Rovers overcame United 2-1 with McCarrick and Malkin scoring for the home side. With the competition hotting up Tranmere must have been relieved to see their next hurdle was Chester City again. Perhaps it was the home advantage but Tranmere were clinical, beating their local rivals 3-0 with McNab, Morrissey and Muir scoring. Tranmere’s next opponents were a team for whom Rovers would develop a deep rivalry with over the next few years, Bolton Wanderers. Rover had already lost to the promotion contenders earlier in the season 3-1 at Prenton Park and no one wanted a repeat of that game. With over nine thousand fans cheering on Tranmere at Prenton Park the home side overturned the earlier season defeat beating Wanderers 2-1 with Steel and Muir scoring the important goals. After seeing off Bolton Tranmere had made it all the way to the Semi Final and only had to see off the weak Doncaster Rovers team who were propping up the lower end of the Fourth Division. Tranmere cruised past Doncaster 3-0 over two legs and secured their second ever visit to Wembley. By the time Tranmere team arrived at Wembley on the 20th May Rovers had secured a place in the Third Division Playoff Final which would see them at Wembley again just a week later. But on that day the team’s focus was on winning the club’s first silverware since 1938. Facing Tranmere that day was Third Division title winners Bristol Rovers who were looking for the double. Bristol had already beat Tranmere twice that season and some may have thought the game a forgone conclusion…expect for Tranmere and it’s fans of course. In front of nearly 50,000 supporters Bristol took control of the game nearly taking the lead after four minutes only to be denied by a double save from Nixon. Soon after the save though Tranmere showed they meant business as Ian Muir scored from a Chris Malkin header. Although Hughes, Garnett and Thomas defending was outstanding Bristol pulled one back at the start of the second half. The pressure was on for Tranmere but in the 71st minute Jim Steel headed in the winner from a Muir cross. 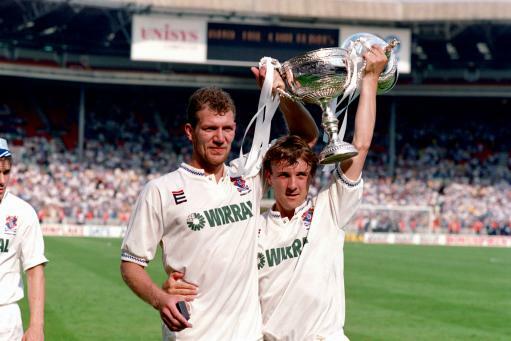 Tranmere had won their first major piece of silverware in over fifty years and a week later it was hoped the playoff trophy would be added to the collection. However Neil Lennon’s Notts County proved too strong for Rovers as County won 2-0. 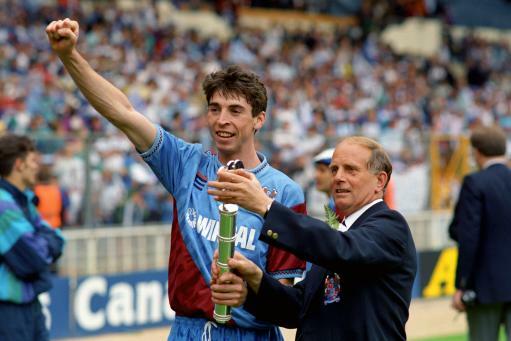 The Leyland DAF Cup may not stand as one of the great cup competitions in the world but this win saw Tranmere become a regular at Wembley over the next decade as they fought to play in the highest league in the country. The summer of 1994 had been a disappointing one for millions of football fans across the country as the USA World Cup took place without England. Having failed to qualify for the World Cup England fans had a summer without any Football. For one Tranmere player though the summer had not been spent watching the World Cup at home as they went over to the States with his national team. John Aldridge had joined the Ireland team to play in the 1994 Cup but his time in the Cup was marred by events on the touchline. By August normal league football was soon to be back on the menu for fans across the land but for Aldo and the Tranmere team international football was still on the cards. Having failed to qualify for the knock stages in the 1992-93 Anglo Italian Cup Tranmere were given a second chance to show their wares on an international stage in the 1994-95 tournament. Over the two years since Tranmere fell out of the Anglo Italian Cup the club had successfully made the First Division Play offs only to be knocked out by Swindon and Leicester City. However these setbacks did not dampen the optimism that encased the club who were in touching distance of the Premier League. With Premier League football being the main aim, to Tranmere and its fans the Anglo Italian Club was seen as a side show with few people being interested. But the club and players wanting to take the rare opportunity of European football readied themselves. The first game was against Venezia from Venice which as away games go wasn’t too bad as fans could take in one Europe’s most historic cities. However the game was drawn at home and so the Italian used to splendour of Venice came to slightly less impressive Birkenhead. In front of the small 3,012 attendance Tranmere took the lead after an Aldo goal which was soon followed by a second by Malkins. However in the 66th minute Cerbone scored from the penalty spot and in the dying moments Bonaldi equalised. Just like in the 1992-93 tournament Tranmere had started on the wrong foot. In 1992-93 the flight carrying players had been paid for by fans wanting to travel with the team but with so few fans interested in the tournament this time round Frank Corfe had to pay for the flights to the first away game. 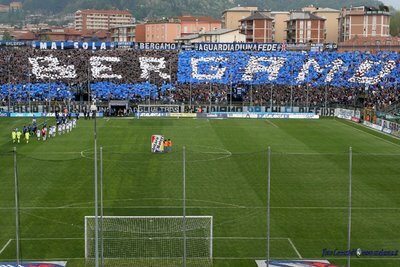 The away game was against Atalanta in Bergamo which was just outside Milan. The few Tranmere fans travelling to game stopped off at the San Siro to see one of football’s most legendary grounds before being wedged in a corner of the 32,000 capacity Stadio Communale. Just like the fans Tranmere were not prioritising the away games as much as they had done in the 1992-93 season as mostly youth player took to the field in Bergamo. One of the youngsters to make his debut for Tranmere was a young Ian Thomas-Moore. This young team lost 2-0 with Montero and Saurini scoring for Atalanta in the one sided game. The next game was at home and fans hoped to try save face in the competition before they were knocked out of the competition. Ascoli were the next and last Italian team to play at Prenton Park in the Anglo-Italian Cup. Ascoli were one of the favourite of the tournament especially with their German international star who opened the scoring after fourteen minute. Oliver Bierhoff had already been capped by the time he came to Prenton Park but his career was only really just getting started. He best remembered for scoring the two winning goals in the Euro 96 final against the Czech Republic. With the Ascoli game finishing 1-0 to the away team Tranmere’s fate was sealed even before they board the plane to their final game against Lecce. Only 286 fans travelled to see Tranmere lose 3-0 at the 55,000 Stadio Commuila. The trip however did have its moments as fans mingled with some of their heroes at the Hotel and on the flight. The rest of the season went well for Tranmere who again made it to the play offs of the First Division but were knocked out by Reading. The 1994-95 season was the last time Tranmere would make the First Division play offs. As the price of Premier League football slipped further and further from the grasp of Tranmere many still looked back on the Anglo Italian Cups as time when the sky was the limit for the club and have fond memories of flights and hotel stays with the team.